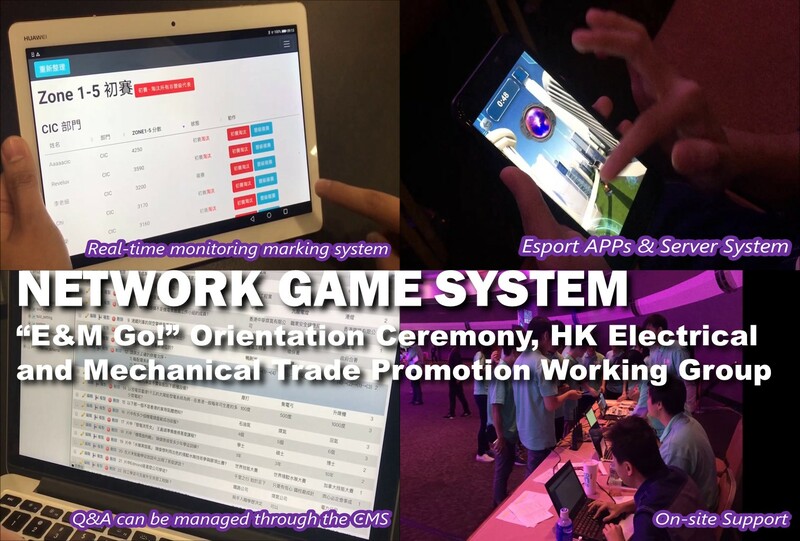 he Esport game competition is based on a network game system that can monitor the scores of different group in real-time. The Esport mobile game linked up with the server system. If the participants have any question, they can ask the answer through the content management system. SenMedia also provided on-site support for the event. The “E&M Go!” Esport game competition had been successfully organized. The Hong Kong Electrical and Mechanical (E&M) Trade Promotion Working Group, formed by the Electrical and Mechanical Services Department (EMSD) and the E&M trade, held the second “E&M GO!” Orientation Ceremony today (September 20). The event attracted over 600 young trainees who joined E&M training schemes organised by various private and public organisations, with an aim to encourage them to pursue their aspirations in the E&M trade. Speaking at the ceremony, the Chief Secretary for Administration, Mr Matthew Cheung Kin-chung, said that Hong Kong will continue to have a number of infrastructure projects closely related to people’s livelihood in the next few years. The number of mechanical and electrical facilities has also increased, thus requiring a large number of mechanical and electrical professionals. He encouraged students to actively equip themselves and develop their strengths in the electromechanical industry, which is filled with development opportunities. The Director of Electrical and Mechanical Services, Mr Alfred Sit, said that the development of the E&M trade relies on trade and relevant government departments to provide ample opportunities for training and employment to aspiring young people. With joint efforts by various stakeholders, the trade and the EMSD, the number of E&M apprentices has been increasing and would gradually improve the manpower provisions of the trade. He added that it has been a widespread trend for the E&M trade to integrate with new technologies, and encouraged the trainees to better equip themselves for the new opportunities. The Working Group has always played important roles in attracting new talents to the industry. With the active participation of the EMSD, the Working Group has organised a number of large-scale promotional events and recruitment expos to boost the professional image and enhance the general public’s knowledge of the E&M industry. With the concerted efforts of different stakeholders, the number of E&M trainees in the trade increased by 40 per cent compared with 2013. For details about the Working Group please visit the Working Group’s Facebook page (www.facebook.com/emengineering).